Are you generally content but secretly desire to be as depressed about life as your friends and co-workers? Are you an artist who lacks the emotional depth to make your work interesting? Perhaps your cheery demeanor at gallery openings, book signings, and film festivals is preventing you from being taken seriously as an “artist”? If you said yes to any of the above, you may be a candidate for YD Industries pro-depressant, Flornan®. 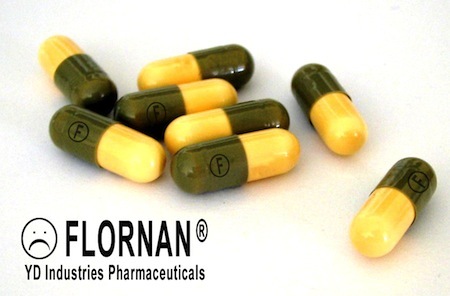 Flornan® comes in easily digestible capsules. In the United States, millions of people share these same longings for a life full of more emotional misery. It is important to know that happiness and contentment are treatable medical conditions. Luckily, YD Industries patented and proven effective medication, Flornan®, is a powerful pro-depressant that here to help you. When taking Flornan®, the time it takes to feel much worse is different for everyone. It could take anywhere from one to five weeks before you’re fully miserable. If you don’t feel worse right away, it’s critical to keep taking your capsules as directed by a medical advisor. The people around you may see a change for the worse before you do, so hang in there! Patients taking Flornan® may experience some side effects. These include: calcification of the nasal passage, dry mouth, limpness, lingering metallic taste in the mouth, tremor, involuntary indigestion, profuse and uncontrollable sweating, and cravings for canned Norwegian sardines followed by explosive diarrhea. Consult with your doctor or Mexican pharmacist today, and begin taking Flornan® tomorrow! Why wait to turn your sunny days into a long winter of discontent?